The eight character couplet is, "Bohai yuan chang, Luling pai yuan." 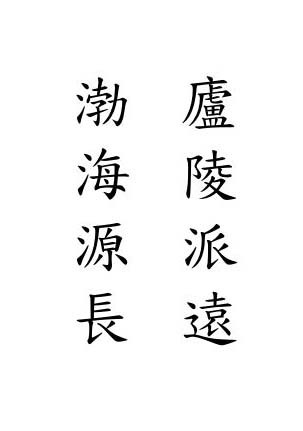 Actually, I'm not positive that the Bohai phrase comes first, since Chinese can be written right to left (the traditional way) as well as left to right (more contemporary). But my best guess is that the couplet should be read left (Bohai phrase first) to right (Luling phrase second), because Bohai has an earlier place in Owyang history, and because the writer in Jeremiah's website used a simplified character as used in the PRC (which suggests reading it in the more contemporary left to right way). Anyway, I'm certainly no expert in classical Chinese. Hell, I can barely order tomato beef chow mein to go. But here are some notes on the couplet, with some help from my Chinese tutor. The "yuan" following Bohai means "origin or source (of a river), fountainhead." "chang" means "long; great length or distance." Luling is also a place name, the ancestral village of Ouyang Xiu (see below) in Jiangxi province, so has great significance in Owyang history. "pai" can be a noun or a verb. As a noun, it means a "group, school, faction, clique." If used as a noun, it may refer to the group of scholars and descendants (the "eight generations of scholars" - "bashi boshi") who continued Ouyang Xiu's work. As a verb, it means "to send, dispatch, assign, appoint." "yuan" means "far, a great distance." Note the parallel construction, which is characteristic of Chinese couplets: Bohai (place name) yuan (the source from which the Owyangs flowed) chang (a great distance); Luling (place name) pai (scholars sent forth) yuan (afar). Putting all this together, the couplet refers to the influence of two very significant places in Owyang history. Bohai, the original source where we all began, and from which the Owyangs have spread far and wide across history, culture, and the world; and Luling, the home of the "eight generations of scholars" and most famous Owyang of all (with the possible exception of Norman Owyang, who had a try-out with the Warriors). Pretty cool. Ouyang Xiu, a statesman, historian, epigrapher, essayist, and poet, was one of the leading cultural figures of the Northern Song dynasty (960-1127). He was the principal compiler of the Xin Wu dai shi (New History of the Five Dynasties) and the Xin Tang shu (New History of the Tang) as well as teacher to other great Song scholars such as Su Shi (1037-1101). Ouyang Xiu undertook the compilation of his own collected writings just before his death in 1072; the collection was published as the Jushi ji (Collected Works of the Retired Scholar) in 1091. A century later, in 1191, Zhou Bida (1126-1204), and other scholars from Ouyang Xiu's ancestral hometown of Luling, Jiangxi, began compiling the Ouyang Wenzhong gong ji (Collected Works of Ouyang Xiu), which was printed in 1196. There are no longer any complete sets of the 1196 Zhou Bida edition of the Ouyang Wenzhong gong ji. The National Library of China has several fragmentary sets . . .
A family couplet, or "dui lian" in Mandarin, is often written on hanging scrolls or carved into wall hangings or pillars along doorways. A couplet is a form of writing somewhat similar to Japanese haiku, in that there is a set format for writing them. Rhyme is not required. The format involves one vertical line of words, usually four or more, matched with another vertical line of the same word count. In this case, it's a pair of four words. Each line of words means something. The trick of a couplet is that the individual words of one vertical line correspond with the word across in the other line. This is what Steve talks about in terms of parallel construction. Steve must be a true scholar. I have a book of surname histories that includes a blurb about the Ouyang name. I'll scan and e-mail it to you later. The surname of 'Ouyang' has a illustrious history. The beginnings can be traced to Gou Jian, King of Yue in the Spring and Autumn Period of ancient China. (For a history on this man, click here.) Several generations later, the Yue kingdom was divided among his direct descendants. One of them occupied the Ou Yu Mountain in Wu Cheng (Wu Xing in Zhejiang province). The southern part of the mountain was known as Yang, so his descendants acquired the surname of 'Ou' or 'Ouyang'. For Hong Kong movie buffs, the Ouyang Feng character was played by the late Leslie Cheung in Wong Kar-fei's 1994 "Ashes of Time" and by Tony Leung (Leung Chiu-wai) in the 1993 comedy "The Eagle-Shooting Heroes." Ouyang Fei-Fei is a Chinese pop singer from Taiwan, who has continued to perform and record since debut in 1971. Perhaps I should see about getting Norman Owyang into one of those Chinese books about famous kinfolk.